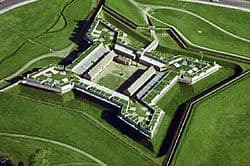 Fort Stanwix was a colonial fort whose construction commenced on August 26, 1758, under the direction of British General John Stanwix, at the location of present-day Rome, New York, but was not completed until about 1762. The star fort was built to guard a portage known as the Oneida Carrying Place during the French and Indian War. Fort Stanwix National Monument, a reconstructed structure built by the National Park Service, now occupies the site. 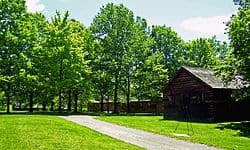 Fort Stanwix was built to guard a portage on the main waterway that connected the Atlantic seacoast to the interior and the Mohawk River, to the east, with Wood Creek, to the west. Wood Creek led to Oneida Lake and ultimately to Oswego on Lake Ontario. The fort was reoccupied by Colonial troops under the command of Colonel Elias Dayton on July 12, 1776. They began reconstruction and renamed it Fort Schuyler, although many continued to call it Fort Stanwix. 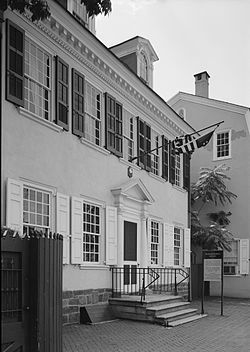 Colonel Peter Gansevoort took over command of the fort on May 3, 1777. On August 3, 1777 the fort was besieged by The King’s 8th Regiment, Loyalists, and Indians, under the command of Brigadier General Barry St. Leger, as part of a three-pronged campaign to divide the American colonies. Gansevoort refused the terms of surrender offered by the British, and the siege commenced. According to local folklore, when the Colonial troops raised the flag over the fort on August 3, 1777, it was the first time that the Flag of the United States was flown in battle. It is more likely that the flag flown at Fort Schuyler was one that consisted only of thirteen stripes, an early version of the Flag of New York, or the Grand Union Flag. The Battle of Oriskany was fought a few miles away when an American relief column, led by General Nicholas Herkimer, was ambushed by Tories and their Indian allies. While many of the besiegers were attending to that battle, the defenders of the fort sallied forth and attacked the enemy camp, looting and destroying enemy stores. Demoralized and reduced in strength, the British withdrew when they heard reports of the approach of yet another relief column, led by General Benedict Arnold. The British forces withdrew through Canada and joined Burgoyne’s campaign at Fort Ticonderoga. The British failure to capture the fort and proceed down the Mohawk Valley was a severe setback and helped lead to the defeat of General John Burgoyne at the Battle of Saratoga. The fort burned to the ground on May 13, 1781 and was not rebuilt. 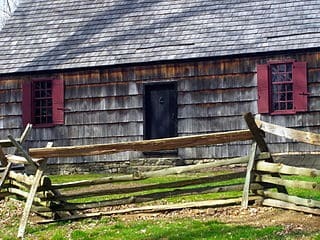 It was abandoned and the garrison took up quarters at Fort Herkimer. The second Treaty of Fort Stanwix was conducted at the fort between the Americans and the Indians in 1784. During the War of 1812 a blockhouse was built on the parade ground. Beginning in 1828 the fortifications were dismantled. The fort was designated a National Monument on August 21, 1935. Between 1974 and 1978 the National Park Service reconstructed the fort; a new visitor center was added in 2005. The monument is currently open year around, operated by the National Park Service.